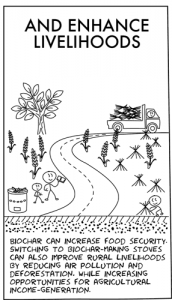 Biochar is defined as carbonised biomass obtained from sustainable sources and sequestered in soils to sustainably enhance their agricultural and environmental value under present and future management. This distinguishes it from charcoal that is used as fuel for heat, as a filter, as a reductant in iron-making or as a colouring agent in industry or art (Lehmann and Joseph, 2015).Biochar, a porous material, can help retain water and nutrients in the soil for the plants to take up as they grow. Due to its adsorption ability, some biochars have the potential to immobilise heavy metals, pesticides, herbicides, and hormones; prevent nitrate leaching and faecal bacteria into waterways; and reduce N2O and CH4 emissions from soils. 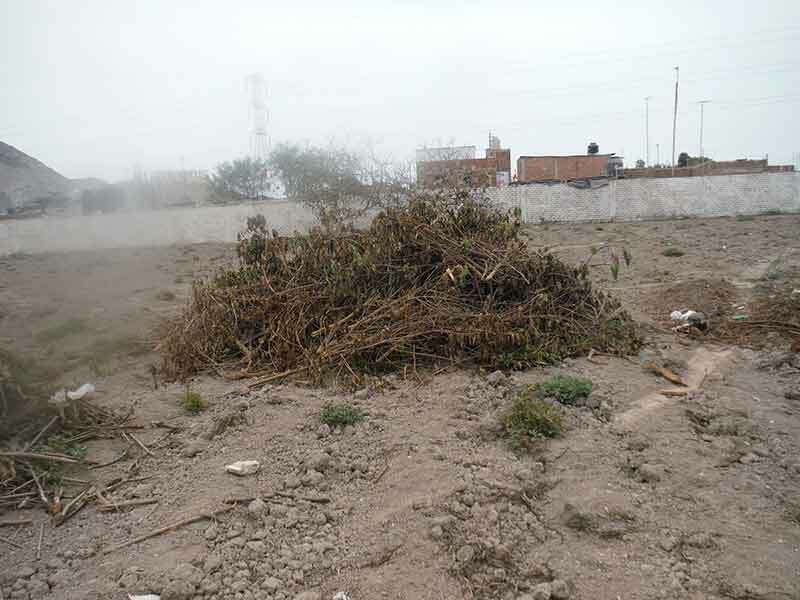 The diversion of biomass from landfill or open burning in fields to biochar production offers an improvement in waste management. Also the heat and the carriers of renewable energy co-produced during biochar production can be recovered to meet the energy needs of the local communities adopting a biochar system. Moreover, based on evidence from the Amazon region, it is understood that the stability of biochar in soils ranges from centennial to millennial timescales, and therefore could be considered as a long-term carbon sink. In November 2015, the International Biochar Initiative (IBI) released version 2.1 of the “standardized product definition and product testing guidelines for biochar that is used in soil” (IBI, 2015). The “IBI Biochar Standards” provide recommendations to ensure that biochar is safe to produce and use but do not prescribe parameters for production and feedstock handling, nor do these provide thresholds or terms for defining the sustainability of the feedstocks or biochar products. For more information on the “IBI Biochar Standards”, please visit http://www.biochar-international.org/characterizationstandard. Researchers have concentrated on making biochar from diverse sources of biomass at different production parameters. Purpose-grown energy crops such as switchgrass, miscanthus, and corn have been evaluated for biochar production but most research trials have used end-of-life biomass (ELB) such as animal manure, forestry and agricultural residues, and sewage sludge. Dedicated biomass plantations for the sole purpose of producing biochar are, under current prices, unlikely to be profitable. Biochar produced from indigenous forest clearing does not result in net emission reductions from a life cycle perspective and would also pose a risk to biodiversity conservation. There is also competition between biomass resources. 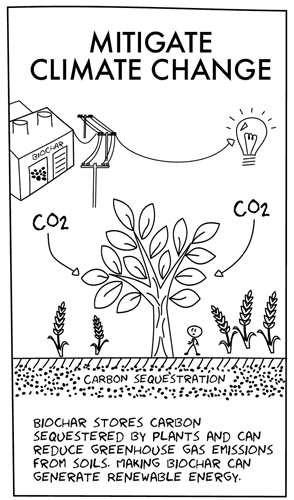 Therefore, the existing biochar plants are dedicated to specific ELB streams that are financially attractive. Crop residues and animal manure, when left in the field play an important role in carbon sequestration, conservation of soil and water, microbial activity, and agricultural productivity. Their use avoids the extra application of synthetic fertilisers and currently are commercialised as compost and soil improvers. Moreover, some crop residues are used to feed livestock. 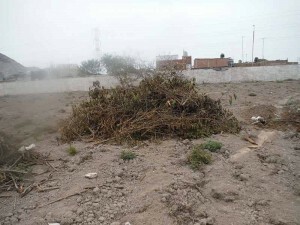 Therefore, crop residues and animal manure represent no waste in agriculture and removal of these ELB from the land to produce biochar should be done carefully, i.e. the optimal amount of feedstock removal should be analysed and the resulting biochar may be reincorporated into the same land where the feedstock originated. 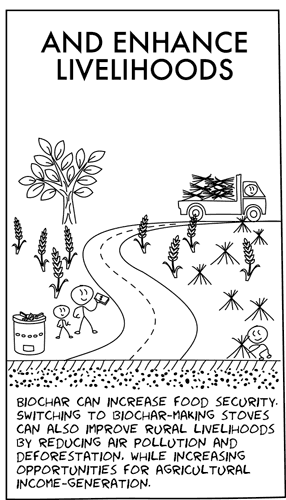 Biochar from sewage sludge produced in the treatment of household, municipal, and industrial sewage may contain heavy metals and/or organic pollutants that could contaminate the soil rather than ameliorate it. Because of this possibility, further research is needed to characterise different types of sewage sludge under various conditions as their level of contamination is likely to vary at different places and times. Moreover, wet feedstocks such as sewage sludge and animal manures raise the question of which kind of carbonisation process would be best to use since they would require significant energy to dry before going through slow pyrolysis. 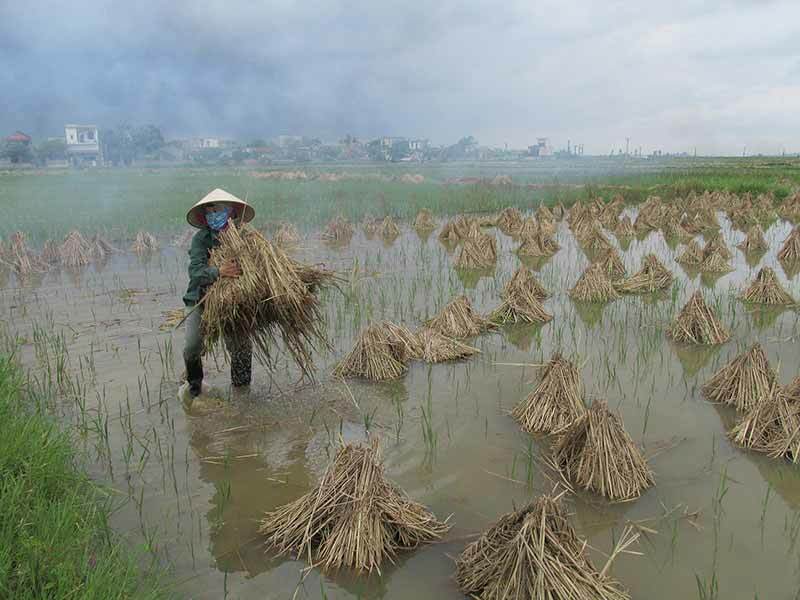 Biochar is a multi-faceted strategy to mitigate climate change. The bio-oil produced during pyrolysis could replace fossil fuels and therefore avoid supplementary GHG emissions. The pyrolysis gas would represent additional GHG emission reduction potential if fossil fuels were displaced to provide heat, electricity or transport fuels in processes occurring outside the biochar system. The successful adoption of biochar-making stoves could reduce biomass consumption for cooking, and therefore reduce the rate of deforestation and CO2 emissions. 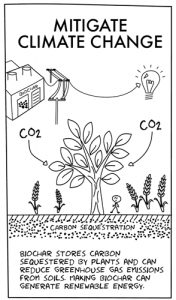 The carbon stabilisation potential of biochar is important and the application of biochar into soils could diminish CH4 and N2O emissions in agriculture. An increasing amount of Life Cycle Assessment (LCA) studies have been conducted for biochar systems around the world. The results suggest that, under certain conditions, the production and application of biochar into soils can be the best use of biomass for climate-change mitigation. Since biomass is a local resource, the best use of biomass depends on the specific local conditions of the baseline and project scenarios. To evaluate the climate-change mitigation potential of a biochar system it is recommended to assess and compare the life cycle climate impacts of using the biomass for biochar production and application to soil with those of using the biomass as per common local practices. The application of biochar into soils is not a new concept. Native pre-Columbian civilisations in the Amazon Basin added biochar to their soils and increased their fertility. Whether they did it on purpose or by accident is uncertain. Because of their black colour and origins, these soils are known in Portuguese as Terra Preta de Indio (Indian black earth). 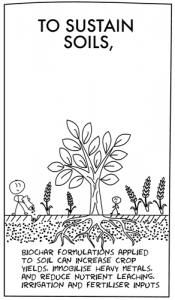 Typically, Terra Preta (TP) soils are found in patches of approximately 20 ha containing higher soil organic matter, greater concentrations of nutrients such as N, P, K, and Ca, and up to 70 times more biochar than surrounding infertile soils. 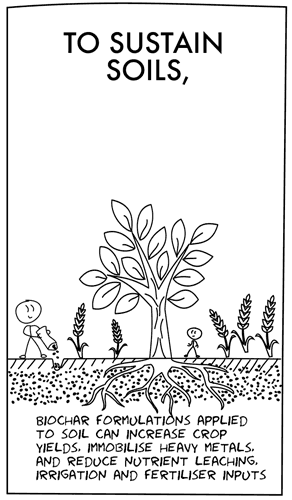 Biochar alone is not responsible for the formation of these highly fertile soils. Research shows that nutrients in TP soils were incorporated in the form of human and animal excrements, aquatic and terrestrial biomass, and food residues such as mammal bones, fish bones, and turtle backs.